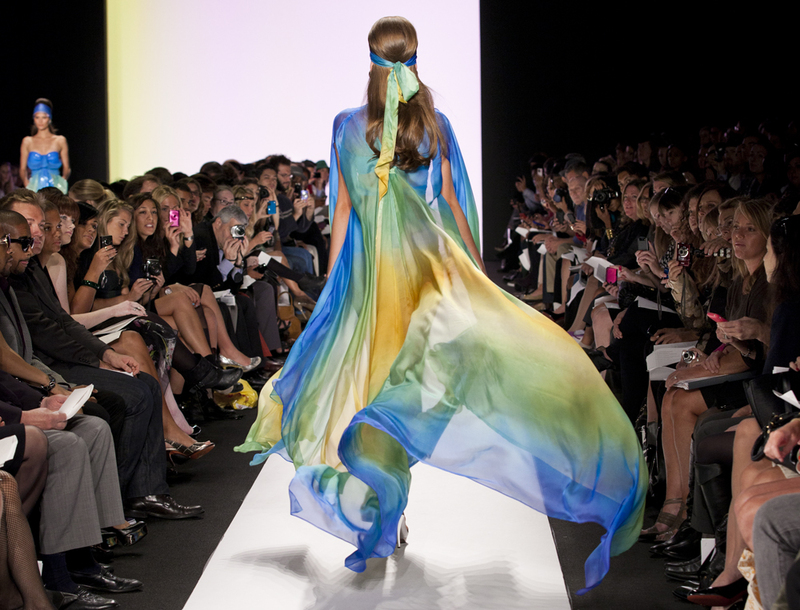 Supermodel Jess Hart walking for Gottex. Photography by Amanda Fordyce. With a sunrise as the ever-so-fitting backdrop for Gottex, the likes of supermodels Karolina Kurkova, Jess Hart and Lily Donaldson powered onto the runway. Draped in aqua blue and hot tangerine lycra concoctions, wrapped up in crisscross shapes, high waists, halter necks, across the shoulders, back less and cut out panels. There were white hot plunging and sweet heart shaped suits with boleros; deep blue bikinis with melted yellow centres and fringes, like a sun rising from the ocean. This was high glamour beachwear at its finest. The looks were completed with visors and flowing capes of silk and crepe like formal gowns (but with a lot more flesh!). Embellishments, metallic numbers, piping and busts encrusted with rock crystals transpired into a show that was hot enough to melt the runway and set the Lincoln Centre ablaze!